As a parent, it's fun to actively plan Halloween with your children. From choosing their costume, selecting the treats, decorating the house, and mapping out the neighborhood trick-or-treating route, there is plenty do to around this time of year. At More Than Paper, we think it's fun to go that extra step and make it just a little bit more special with personalized goodies that can be used year after year. This is why we've curated this "personalized Halloween" board below with ideas from More Than Paper and a few other places on the web to share with our readers. From personalized mealtime, costumes, treats and decorations, this is bound to be the most exciting Halloween yet! These personalized laminated placemats and dishes (more plates, cups, bowls not shown!) are fun to bring out at mealtime all October long. More Than Paper has a variety of plates from which to choose, too -- like this green, purple, orange and black polka dot one by Kelly Hughes Designs. 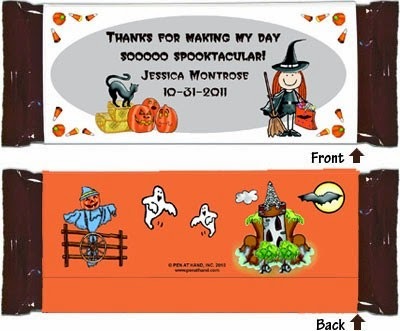 We found a personalized "Happy Halloween" giant banner, complete with grommets and string to hang from your home outside. The super cute place mats by Pen at Hand are from More Than Paper. 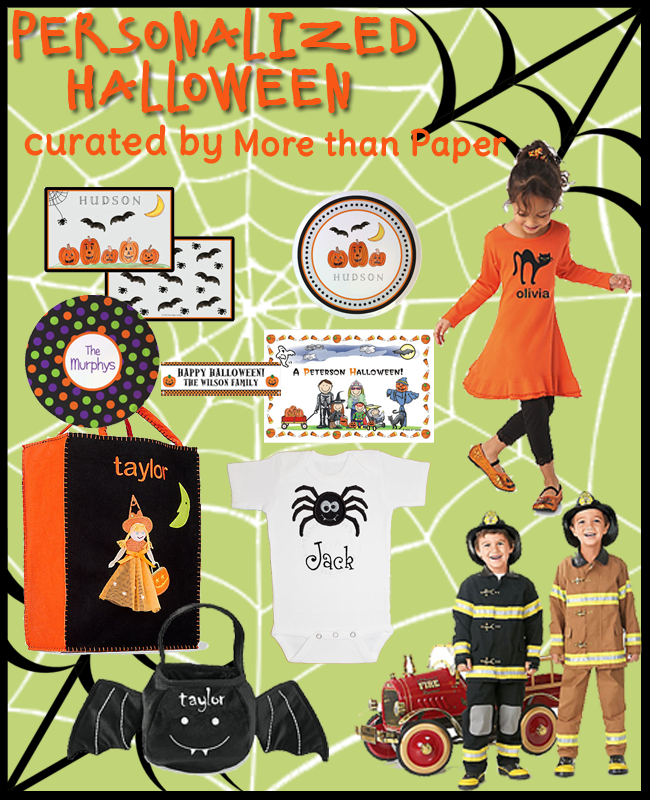 When it comes time to treat collecting, we love the witch princess and bat by Chasing Fireflies and the personalized dress and fireman costume can't be beat! If it's baby's first Halloween, be sure to check out this adorable spider onesie! We found it and several other cute ones on Etsy (click here to buy!) If you are really into the spirit and want to go all out, try personalized chocolate bar/candy covers like the ones below at More Than Paper. What a special treat to pass out on Halloween, they'd also be great for a classroom party at school. 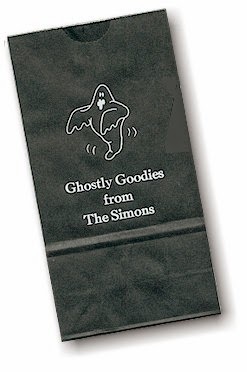 If you are hosting a party and doing favors, consider these personalized favor bags. 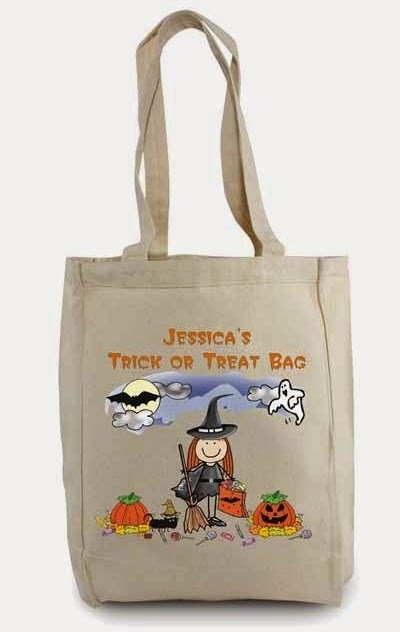 This lightweight personalized trick-or-treat bag by Pen at Hand can be used year after year and be a treasured keepsake. It holds a lot of loot, too! At just $23, we think the price cannot be beat. So what are you doing for a personalized Halloween? Get shopping at More Than Paper now! Most orders arrive within 2 weeks of your purchase, so plan ahead and you'll be ready!